Since last I wrote I have travelled to London and then up North into southern Scotland (I write this looking down at the station in Dumfries, having passed the one-time house of Scotland’s Bard). Today I would like to continue writing on some of the historic methods of mining coal, in part because, in certain parts of the world, this is still the way it is done. Last time I had talked a little about how mining started where the coal seam came to the surface, or outcropped, and that miners worked their way into the hillside digging the coal out creating both a passage deeper into the seam, and also leaving some pillars, as they widened out the passage way to mine more of the coal. Other times, as the coal became deeper, instead of working from the outcrop, they would sink a small shaft, and mine coal out from around its walls. Because the mines thus had the narrow shaft and then widened in the coal seam they became known as bell pits. They were used in parts of Northumberland as late as World War 1. 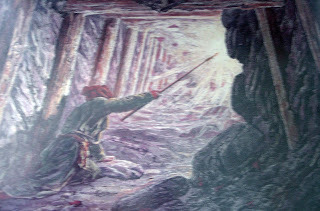 The miner would break out the coal with a pick, and hand load it into baskets, or corves, that would then, initially be carried up the ladder by children or women. However as the mine got deeper the ladder haulage would be replaced by a hand-turned winch, or later and for deeper mines, a horse gin or other winching system using an animal. A two-horse gin is reported to have been able to raise some 2.5 tons of coal an hour. As demand grew, so the underground mining pattern would grow with it. 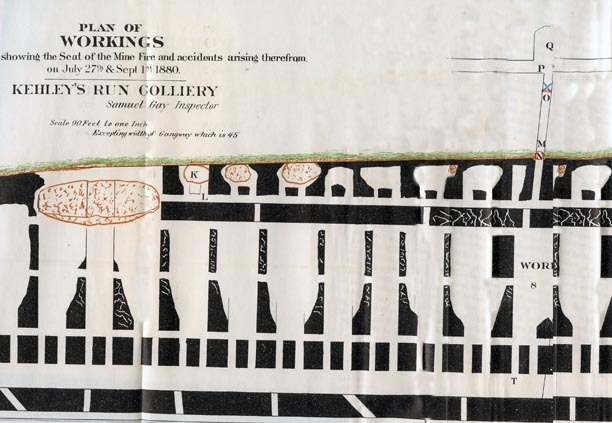 This may was from the Kehley’s Run Mine in Shenandoah, PA. The plan shows how, from the original drift into the side of the hill, the mine spread out along and behind the outcrop, leaving as small a pillar as possible to hold the roof up. 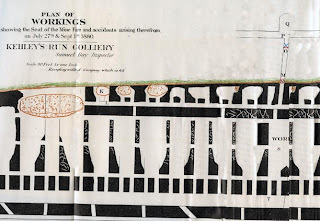 You can see in the illustration how the mine (the current entry is at M, the earlier entry having been closed by the roof collapse shown) mined as much coal as possible to leave the least amount of coal, and that this could cause roof falls. I mentioned one of the fires at the mine, but this mine also raised attention from one of the many riots that erupted between miners, mine owners and their security guards. 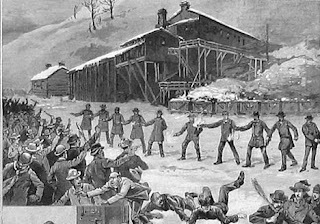 Some of these stories have been dramatized in movies such as the “Mollie Maguires”, but it was a grim and vicious set of confrontations based on grim working conditions. 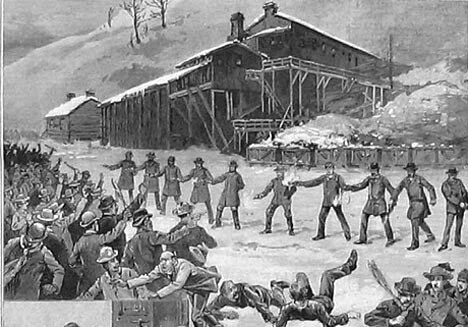 In one seven year period some 566 miners were killed and 1,665 were injured in Schuylkill County, PA alone. You might be able to get some sense of the grim conditions from the mine plan. Conditions had been worse in Europe. There are a number of nasty things that can happen in coal mines. As we recently saw and heard, one of them relates to the gas that is given off during mining. Like natural gas from other sources, in ranges from 5 – 15% this methane can be explosive and thus the levels of gas must be kept below this level (hopefully below 1%) if the miner is to be safe. The other gas that had to be watched for was carbon dioxide, which in contrast with methane, which being lighter than air collects in the roof, is heavier and thus pools on the floor. So that if you were getting down to cut the starting slot in the bottom of the coal seam, you might just drop into a pool. It was called choke damp – though that was also the name given to carbon monoxide, which could also seep out of the coal. All these gases are colorless and odorless so that without some form of detection (the canary for example, or using a candle as a test) they can lurk to catch the unsuspecting. 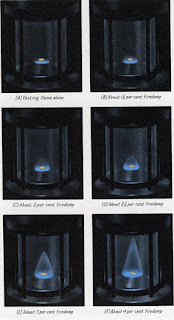 With the invention of the safety lamp (where the heat of the flame is removed by a surrounding mesh of copper wire) it became possible to use the lamp itself as a testing tool. 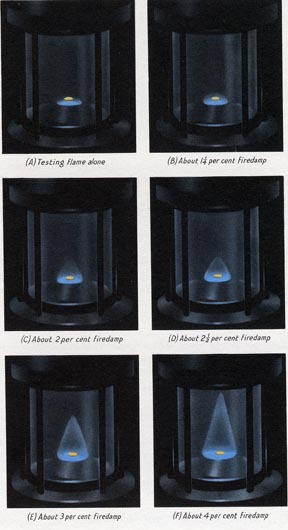 One of my first mining tests was to make sure that I could tell, by the height and shape of the small blue flame of the methane burning over the lowered flame in the lamp, what the gas concentration was. (Each lamp was in a separate hood, and I remember that they had two at the same concentration in the set of around half-a-dozen I had to evaluate). But, as they mined coal from further away from the shaft, the air would not easily move around the workings, and since the coal would give off other gasses, as well as methane, there needed to be some way of circulating the air. 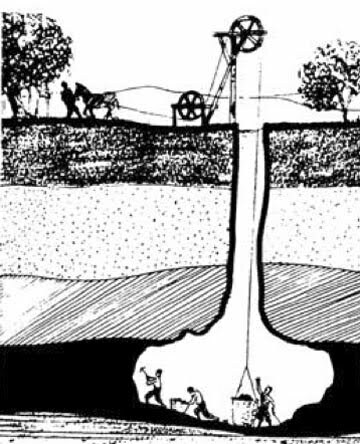 And so the miners began to run sets of tunnels out into the coal that ran parallel to one another, but with cross tunnels (cross-cuts) between them so that they could circulate air around and up to the working area. For many years, starting in around 1810 the motive power for the air was created by having a fire in the bottom of the shaft, in a special furnace room. Usually these were underground, although there was the occasional one at the surface. Unfortunately if the fire ignited the surrounding timber that was being used for support, then a major fire could result, killing everyone underground. This was the case with the Avondale mine disaster in 1869, at the time the worst industrial accident in American history, 110 people died. At first there was only one shaft or tunnel leading in and out of the workings, but a major accident occurred at New Hartley in Northumberland, UK in 1862 where the main beam for the dewatering pump fell into the shaft, blocking it. The 199 men and boys in the mine, virtually the entire working male population of the village, were all killed, It was a result of those deaths that legislation was passed that required that there be two separate ways to get out of a mine. Where the mine is deep underground this means that there are generally two shafts, or more from the workings to the surface. (My Dad was manager at the resurrected mine, and the village school was the first primary school that I went to). As the working face grew away from the shaft, it became too slow to rely on women and children to carry the baskets, on their backs, to the shaft and up out of the mine. ( A woman was reported to be able to carry about 56 lb of coal at a time. So first rails were used to slide the baskets along. Then wheels were added, first to flats, and then to small tubs. At first these were of wood, but then were changed to metal. Although there are still parts of the world where this type of primitive mining still occurs, and where women and children are used to help get the coal out, in most countries they have been banned from underground work. (This was the Act of 1842 in the United Kingdom) . Taking the coal from the miner or hewer to the shaft was known as putting or hurrying. (I learned it as putting). "I have been down six weeks and make 10 to 14 rakes a day; I carry a full 56 lbs. of coal in a wooden bucket. I work with sister Jesse and mother. It is dark the time we go." "I have wrought in the bowels of the earth 33 years. I have been married 23 years and had nine children, six are alive and three died of typhus a few years since. Have had two dead born. Horse-work ruins the women; it crushes their haunches, bends their ankles and makes them old women at 40. " "I hurry for a man with my sister Anne who is going 18. He is good to us. I don't like being in the pit. I am tired and afraid. I go at 4:30 after having porridge for breakfast. I start hurrying at 5. We have dinner at noon. We have dry bread and nothing else. There is water in the pit but we don't sup it. " With time horses (or pit ponies as they were called) were taken underground and used to haul the tubs. Ponies were used for haulage well into my working career, and leading one was the first underground job that I had, when I worked in the mines before going to college. They served two purposes, being used firstly to haul the coal from the face, but also to haul wood back to the working area, where the miner would cut the wooden props to length and then wedge them against the roof to hold it up while he worked under it. Because of low cost, the tubs had very crude axles, and so, to go around a turn, one had first to stop the pony, then switch the points on the rail, then start the pony round the turn, then run back to the back end of the tub, and manually twist the tub so that the axles turned to align with the turn. Fail to do any one of those and the tub came off the rails, meaning you had to unload it, put it back on the rails, and then reload it – all the while with the pony standing there enjoying the break. He would put his “token” in the tub before he would fill it, and so, when the tub was emptied at the surface, he would be given credit for that coal, providing it did not have much stone in the pile. Your posts on mining are fascinating! I had not realized that, within your working lifetime, pit ponies had still been in use. It is easy to forget how quickly things have changed. An eye-opener for me in visiting some of the industrial museums in Europe was the realization that, even though life was hard for the people working down the mines, they chose it because it was better for them than the alternatives. People left rural Ireland to go and work in Scottish coal mines. There's a message there for some of today's more extreme "back to the land" environmentalists. These posts on coal are surreal and brilliant. The fact that you were involved in handling pit ponies is awe inspiring. Sad to say Morgan, the reality was much more mundane. 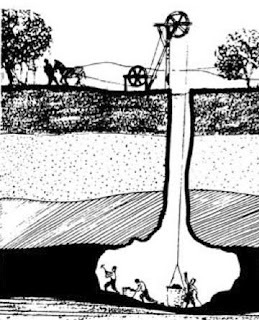 I believe that there are a number of mines that still use pit ponies, though am not sure if they are still used in the US or not, I know that they were removed from the British mines some years ago, and the last one died just about a year ago.